In need of metal roof repair? Your metal or steel roof can be trusted to the experts here at Metal Building Company. We are trained to handle any type of leak or damage and can have your roof repaired quickly. Don’t let a faulty roof damage the rest of your building. By fixing your metal roof, we can prevent future damage and help to mitigate your problem immediately. No project is too big or too small for us. We can repair your damaged and leaky roofs, replace gutters and downspouts, skylights, vents and louvers. Step 1: Contact Us Here or Call 510-635-0111. Step 2: We will identify the extent of the repair work needed. Step 3: Receive a free estimate on the cost of the metal roof repairs needed. Step 4: We’ll schedule your repair! That’s it! Feel free to call us at 510-635-0111 if you need more information or to talk about your project over the phone. We’d be glad to hear from you. About us: Metal Building Company has been servicing the entire San Francisco Bay Area since 1976. We offer a knowledgeable and experienced staff and the best value you can find. We adhere to the highest standards and practices and are committed to seeing each repair through to your complete satisfaction. We guarantee it on every project. Your metal roof repair is not complete until you say it is. Check us out on yelp! Read more about us here. Serving: The San Francisco Bay Area and Sacramento / Stockton areas including the North Bay area: Marin County, Sonoma County, Napa County, Santa Rosa, and Solano County including Fairfield and Vacaville. Also includes the Peninsula: Atherton, Belmont, Brisbane, Burlingame, Colma, Daly City, East Palo Alto, Foster City, Half Moon Bay, Hillsborough, Los Altos, Los Altos Hills, Menlo Park, Millbrae, Mountain View, Palo Alto, Pacifica, Portola Valley, Redwood City, Redwood Shores, San Bruno, San Carlos, San Mateo, South San Francisco and Woodside. 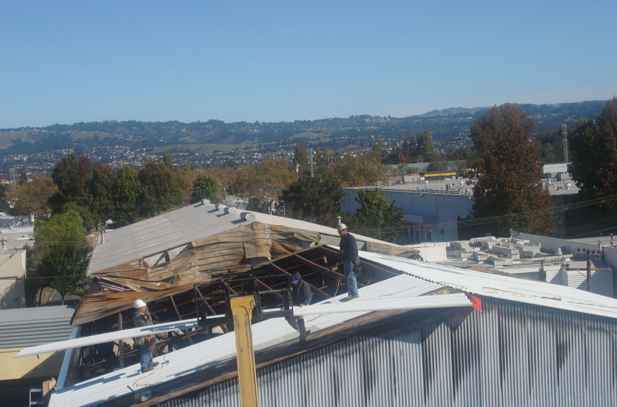 We regularly have metal and steel roof repairs in the East Bay area: Oakland, Hayward, Fremont, Berkeley, Richmond, Alameda, Castro Valley, Newark, Union City, Emeryville, Albany, San Leandro, San Pablo, Crockett, El Sobrante, Pinole, San Lorenzo, Hercules, Rodeo, Piedmont, Pleasanton, Walnut Creek, Concord, Martinez, Danville, and El Cerrito. We also drive to the San Jose area which includes: Santa Clara, Milpitas, Cupertino, Sunnyvale, Saratoga, Campbell, Los Gatos, Morgan Hill and Gilroy. That includes all major surrounding cities of the areas mentioned.